The mobile node sends a request from the foreign network to some third party device somewhere on the internetwork. The third party device responds back to the mobile node. However, this sends the reply back to the mobile node's home address on its home network. 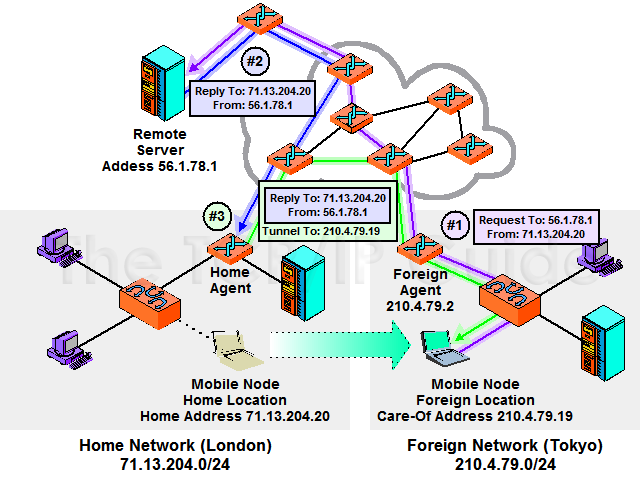 The home agent intercepts the response on the home network and tunnels it back to the mobile node. This process is illustrated in Figure 134. The reverse transaction would be pretty much the same, just in the reverse order. In that case the third party (Internet) device would send a request to mobile node, which would be received and forwarded by the home agent. The mobile node would reply back directly to the Internet host. This example illustrates how a typical request/reply message exchange in Mobile IP results in a triangle of communication. In step #1, the mobile node sends a request to a remote server somewhere on the Internet. It uses its own home address as the source for this request, so in step #2 the reply goes back to the home agent. Step #3 consists of the home agent tunneling the reply back to the mobile node. Key Concept: Once Mobile IP is set up and operational, it works by having the home agent encapsulate and tunnel received datagrams to the mobile node. The mobile device normally sends datagrams directly to Internet hosts, which respond back to the mobiles home agent which forwards those datagrams to the mobile node. This means a request/reply communication takes three transmissions.